Rachel Ellis is highly regarded for the subtle geometry of her drawings of urban subjects – interiors, inner city backyards and rooftops. A committed Christian, she won the Blake Prize in 1996 with a powerful drawing of the woman wiping her tears from the feet of Jesus. 'Evensong' clearly has spiritual undertones. For the artist it is 'a prayer to the author of light and nature' as experienced in the suburban everyday. 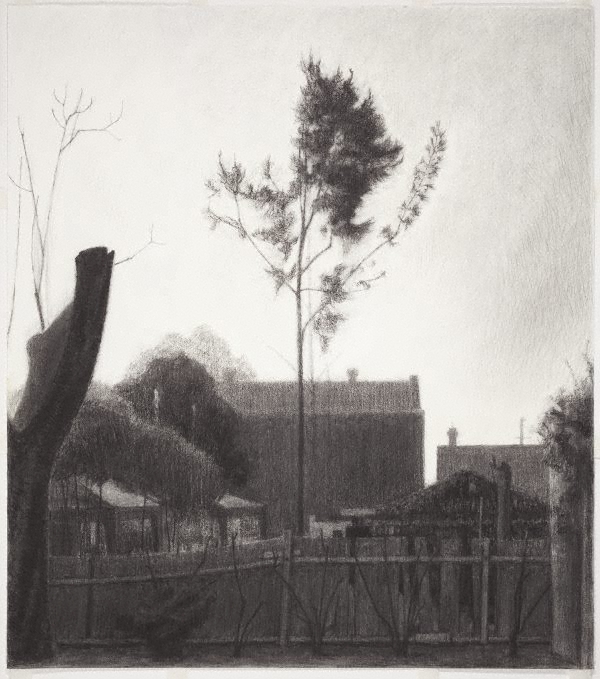 Intensely personal, the setting for this drawing is the view to neighbours' houses on Durham and Havannah Streets, Bathurst, over the side fence of her house. However the real focus of attention is the weathered fence and two trees, one lopped (or amputated) to a tall stump, the other reaching upwards, feather-like, into the bright afterglow of late afternoon light. Light to dense layers of charcoal worked well into the grain of heavy drawing paper, have created a bold chiaroscuro and a rich tactile graphic surface. The drawings of Lloyd Rees and Seurat come to mind, but also something of the spirit of Samuel Palmer and Frederick Griggs. This work was a finalist in the 2011 Dobell Prize and was acquired by the Gallery in 2012.